Neither in contemporary sociology nor in legal theory is much attention paid to the theoretical object of commands. This paper explores some features of commands that tend to remain largely invisible in social action, as well as largely under-theorized in the scholarly literature. 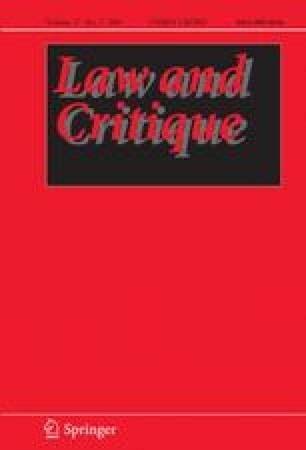 The analysis draws on early reflection by Elias Canetti and tries to clarify the dynamics of the relationship between law and commands from a sociological perspective. The main claim is that command cannot be reduced to a linguistic entity, but has to be considered in the more complex frame of a direct relationship among subjects and their bodies within a shared space. Explanation of commands is made even more difficult by the fact that they take place in a space that is located ambiguously in between the realm of the subjective and that of the objective, in between passions and institutions. I would like to thank all those who gave me their important and valuable comments to improve earlier versions of this text: Rod Macdonald, Robert Leckey, Giolo Fele, Maria Paola Mittica, Ivan Pupolizio, Isacco Turina, and one anonymous editorial reviewer.